Area 51 is a US military base located in south-central Nevada and enclosed by mountains and harsh desert terrains. 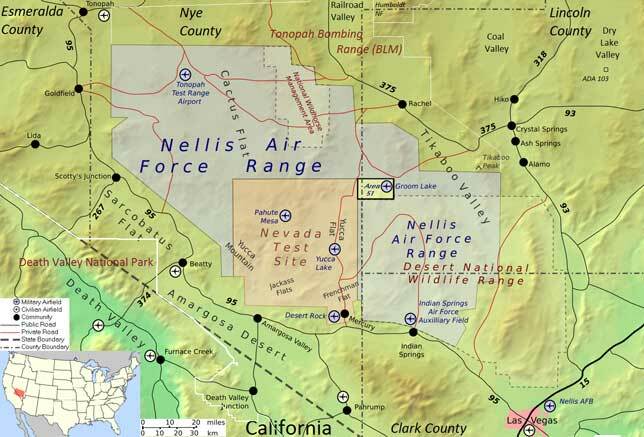 It is approximately 83 miles (134 km) from Las Vegas and is surrounded by the Nellis Air Force Range and borders the Nevada Test Site. The base receives its names from numbered grid assigned by the Atomic Energy Commission (now the part of the US Department of Energy). Other names for the base include Groom Lake, Dreamland, Paradise Ranch, the Ranch, Watertown (CIA director Allen Dulles’ hometown), Watertown Strip, Homey Airport, and the Box. It is often referred to as the most famous secret base in the world. Although the base was never itself secret and became widely known in the 80s. its existence was not formally acknowledges by the US government until mid-2013. Employees of Area 51 usually travel through the base on buses with blacked out windows or fly out of the JANET (Just Another Non Existent Terminal) terminal at Las Vegas’ McCarran International Airport. The lack of official acknowledgment by the government gave rise to a number of conspiracy theories and the base quickly entered UFO lore when rumors of a downed saucer at Roswell secretly being transported to Area 51. 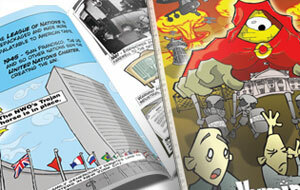 Between 1951 and 1954, the area was used by the Atomic Energy Commission to conduct most its nuclear tests. The location is covered in debris due to gunnery practice by bombers at Nellis Air Force Base. In 1955, the CIA begins Operation AQUATONE – a secret project with the purpose of designing an aircraft that could fly high enough to avoid Soviet surface-to-air missiles and photograph Soviet nuclear and military installations. The CIA and Skunk Works, arm manufacturer Lockheed’s elite division begin development on the U-2 spy plane. 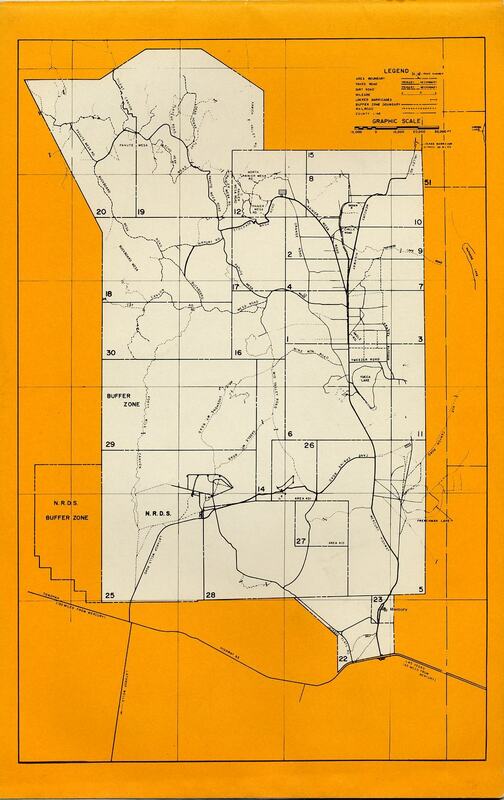 Several surveyors from Lockheed fly over the area north east of Nellis Air Force base and spot Groom Lake, a dry lakebed surrounded by mountain range and sufficiently away from public area. 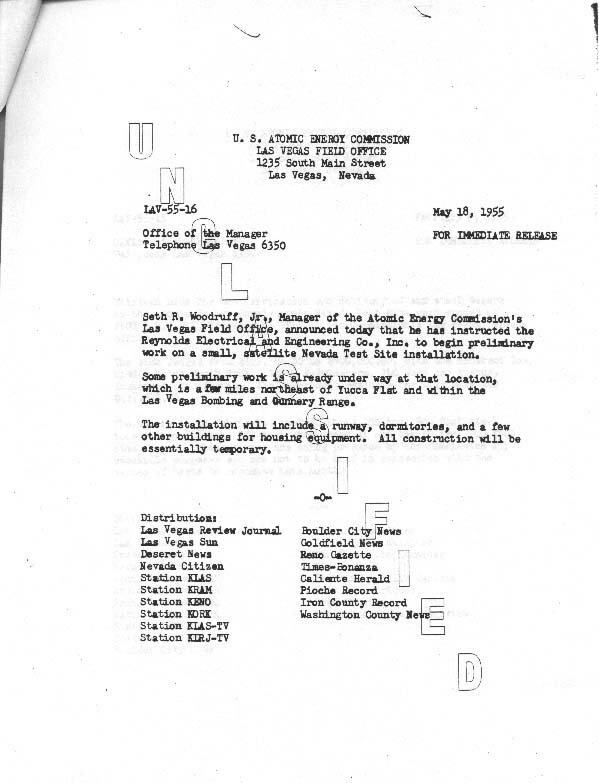 In may 1955, the Atomic Energy Commission publicly announces the building of a “satellite Nevada Test Site installation” via a press release. That same year, employees from the CIA, the Air Force, and Lockheed begin arriving at the base. The first U-2 is disassembled in Burbank and secretly transported to Area 51 for testing. The plane is painted with NACA (NASA’s precursor) markings and operated under the cover of weather-related research. In 1998, the CIA revealed some details of its U-2 program. and claim it was responsible for numerous UFO sightings of the 50s and 60s. 1957 – Soviet satellite Sputnik 1 begins orbiting around Earth and capturing shots of US secret installations, including Area 51. Groom Lake employers are aware of the satellite’s trajectory and shelter aircrafts in hangers. However, the Soviets are able to determine the aircraft’s shape by heat signatures left on the tarmac. The CIA begins Operation RAINBOW– radar absorbing panels are glued on the outside of the U-2 plane in order to make it invisible to radar. However, the panels increase drag, and its loss of aerodynamics also results into slower speeds and lower altitude. In 1958, President Eisenhower signs Executive Order No. 10633, establishing restricted airspace over the Groom Lake base. In 1959, defense contractor EG&G moves its radar testing operation to Area 51 and soon begin testing the radar deflecting abilities of Operation OXCART, the new Lockheed A-12. EG&G conducts radar tests on mock-ups and concept demonstrators. Sidenote: The CIA sets up dummy corporations in order to acquire titanium from the soviets without their knowledge. 1960 – having successfully tested the U-2, the aircraft goes operational and routinely fly over Soviet territory gathering intelligence. Soviet spies in Turkey have alerted the Soviet authorities of the existence of the U-2, but the Soviets are unable to intercept any. However, they finally succeed when Francis Gary Powell’s U-2 is shot down over Soviet territory. Powell is soon embarrassingly paraded on international television, along with the U-2’s remains, and photographs taken of Soviet military bases. Powell returns to the United States in a prisoner exchange 2 years later. 1962 – the first A-12 prototype arrives at Groom Lake. Unlike the U-2, the A-12 has radar repelling ability built in. The A-12 goes operational in 1965. It leads to the development of the recently operational SR-71s. 1968 – Area 51 receives a captured MIG-21 acquired from an Iraqi defector to Israel. They begin Operation HAVE DOUGHNUT, to assess the MIG’s capabilities. They determine that Soviets aircrafts are not superior to American aircrafts and begin training American pilots against MIGs at Area 51. They receive two MIG-17s the following year and test them under Operation HAVE DRILL and HAVE FERRY. Units assigned to the MIGs are known as Red Hats. 1974 – Skylab astronauts photograph Area 51 from outer space leading to a dispute between the CIA and NASA. 1977 – Researchers begin testing unusual flat-faceted fuselage crafts in order to make planes invisible to radar. Development of the Lockheed HAVE BLUE eventually lead to the development of the F-117, the first US-built plane to be completely invisible to radar. 1979 – The CIA relinquishes control of Area 51 to the Air Force. 1981 – The first YF-117A arrives at Area 51 for its maiden flight. That same year they test the F-117 Nighthawk. 1982– Defense contractor Northrop’s flat-paneled TACIT BLUE arrives at Area 51 for testing. The plane is able to demonstrate a number of stealth technology concepts. The technology is based on the work of Nazi scientists obtained through Operation Paperclip who had worked on the Horten Ho 229 during World War 2, the world’s first stealth plane. These technologies lead Northrop to the development of the hugely expensive B-2 Stealth Bomber. 1989 – Bob Lazar comes forward with claims of having worked at S-4, an underground secret facility located near Area 51. Lazar reported having seen multiple flying saucers and that the US government was reversing alien technology powered by element 115 at Area 51. 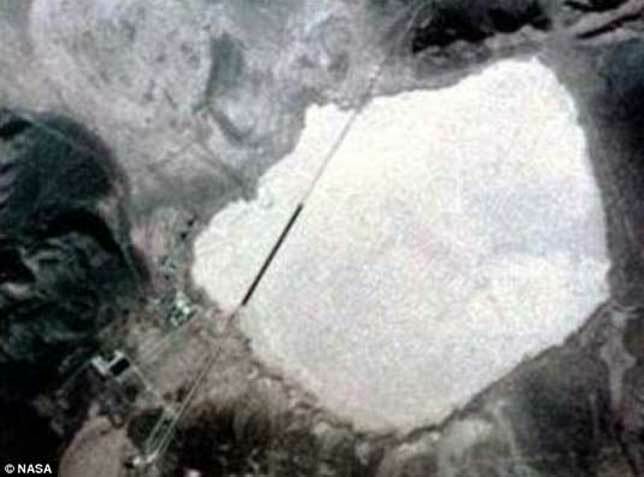 Lazar’s claims soon made national news and the location of the test site becomes mainstream knowledge, bringing unwanted attention to stealth technology research conducted at Area 51. 1994 – Former Area 51 employees file a lawsuit against the Federal government. Employees exposed to toxic fumes from burning crafts and radar absorbing paneling covered in jet fuel in large burn pits are getting sick and dying. The Air Force considered the radar absorbing materials (RAM) to be highly classified and did not want to risk trucking it outside the base. President Clinton exempts the base or any other black site from any environmental liabilities for reasons of ‘national security’ with the signing of Presidential Determination No. 95-48 in 1995. 1995 – The Federal Government seizes additional land surrounding Area 51, including White Sides 11 miles (17 km) from the base and Freedom Ridge, 12 miles (19 km) off, then the most popular spots for viewing Area 51. Observers moved on to Tikaboo Peak, 26 miles (41 km) from the base. If anything, this relatively recent seizure suggests that the base is still very much active. William Fay, executive producer of upcoming Independence Day seeks the military’s assistance for the film. The Pentagon is always keen to help Hollywood with films that portray the US military in a favorable light. However, the Pentagon refuses to help the producers unless they remove all mentions of Area 51 from the film. 1996 – Following the box office success of Independence Day, Nevada officially designates State Route 375 the Extraterrestrial Highway. 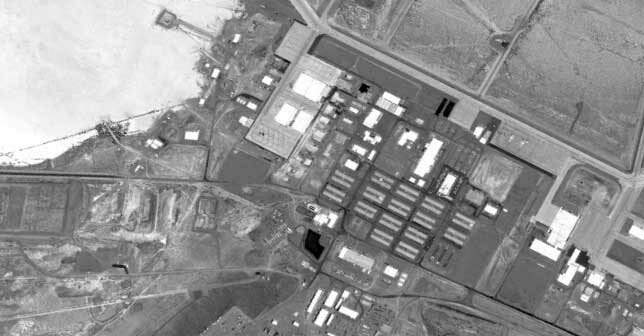 2013 – The CIA formally acknowledges the existence of Area 51 and releases further details on the research done at the base. What is Area 51 used for today? It is not known what Area 51 is used for today. However, we do know that JANET Boeing 737 regularly take off from Vegas and the Air Force continues to make improvements to the base and its runways. It is speculated that the base is mainly used for testing drones and other unmanned aerial vehicles (UAVS). The Cannabis Conspiracy: Why is Weed Illegal?